I tend to put my laptop to “sleep” at the end of the office day but often fire it back up at home. One bad habit of mine is having too many apps running at the same time (thanks to UltraMon the problem is now worse). Putting a PC into “sleep” tries to commit things to RAM and if it runs out (it does) then to hard disk. “Awakening” causes it to push things off of the hard disk and back into memory. This takes a long time. My solution was a simple VBS script to transverse and kill the most common applications right before “sleep”. I’ve tied this to a slickrun command “kill” to make it easier to run. Script below, enjoy! MySQLInstanceConfig.exe".Error in manifest or policy file "…MySQLInstanceConfig.exe" on line 6. The value "asAdministrator" of attribute "level" in element "urn:schemas-microsoft-com:asm.v1^requestedPrivileges" is invalid. A quick google came up with a workaround and a fix which involves an oldie but still goodie, ResourceHacker. This should be the same for Vista too. 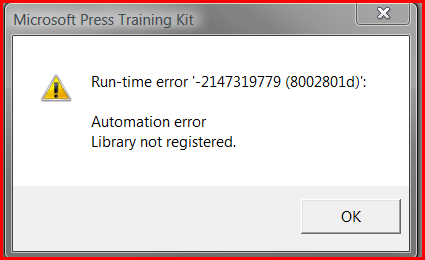 So I’m trying to practice for the MCTS Exam 70-536 exam using the practice test that comes with the self paced training kit book, but keep getting this error every time I run it. I’m on Vista SP1. Doesn’t look like I’m the only one either. I sent in a request to the MS people so we’ll see. Besides GP 10, they gave a quick demo of Dynamics CRM (At one point CRM was going to live under the Live brand but this has changed). What I saw was pretty sweet, basically it lives within Outlook. They also demo SharePoint 2007, I was pretty impressed with this too. GP looks and works like Office 2007 (Ribbon, smart favorites, etc…) so getting Accounting team accustomed will be a task. Workflow, PO process, auto notifications with things post, sales hit a certain number, item is sold, good stuff here. Search/Filters MUCH easier, custom column views, good stuff here. 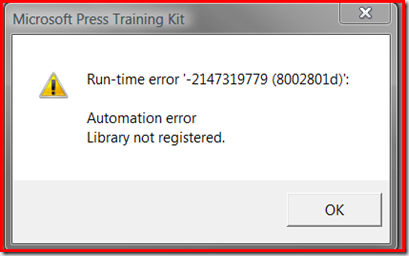 Excel Reports Server – They are really pushing this, I get some GP data, make it look how I want then save the excel document, this automatically gets pushed back to great plains so next time I open the report I get live data and others can see it too. Today I found Windows Vista Battery Saver. This looks very promising, it automagically turns off Aero and Sidebar when the laptop is running on battery and it’s open source so you can peek at the code that manipulates the theme on Vista. So I’ve been using Vista as my main OS for almost 2 months now. Time to give a short run down on the Good, Bad, and Ugly. Areo Glass Theme. Sorry OS X but Areo Glass is so much prettier then you. Changing Themes Color. Right now I’m digging green. Ready Boost. I got a 4 gig USB card helping free the hard drive of tedious task and extending my laptop’s battery. Stable. This should be a given but no blue screen, freezes, or spinning beach balls. I would say this is the most stable OS I have ever used. Sleep Mode. This never worked 100% of the time with XP. No problems so far in Vista. Search. Being able to search from the Windows start menu is almost enough to make me get rid of SlickRun, almost. Snipping Tool. Finally Windows ships with a much better screen capturing tool. No more “My Documents” or ”My Pictures”. They have renamed them to “Documents” & “Pictures”, finally. New Movie Maker. A nice upgrade over it’s predecessor. DreamScene. This is really, really cool, having a movie play as your background. It does draw a on resources though, that is why I don’t have it on 100% of the time. Remote Desktop. Until my fellow Network IT guys upgrade Terminal Services on ALL of the servers, I have to type in my password twice OR type it in something once so I get the Windows login prompt. Come on guys, backward compatibility is a good thing. No more NetMeeting So Net Meeting is old & didn’t have a ton of features, but it worked as expected. Looks like you can contact Microsoft to get a special NetMeeting installer for Vista. Cancel or Allow. This feature works if you are a web surfer/emailer but no way for a power user like myself. This is the first thing I turned off. So far I have not ran into any driver problems or devices not working properly. I’ll keep you updated.